While spending Christmas together as a family in Eureka Springs last December, we heard the news that my cousin Jeff has got engaged to his girlfriend, Melissa. Way to go Jeff & Melissa! Fast forward 8 months and it is now time for their wedding. The happy couple lives in Philadelphia, which is where the wedding will be, so this calls for a road trip. I am making this trip with my Mom and Dad (PK and KK) and couldn’t be more excited. We left on Friday night after work, on 8/25. 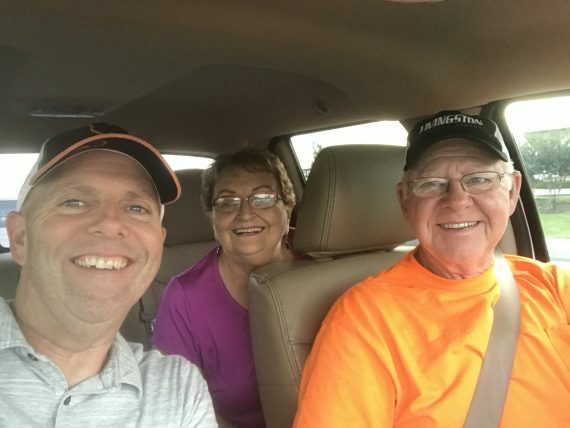 When my folks pulled up in the driveway to pick me up, I was greeted with hugs and the statement, “THIS IS GOING TO BE A GREAT TRIP!” Couldn’t agree more! These first few days of the trip is all about connecting with some friends and family. 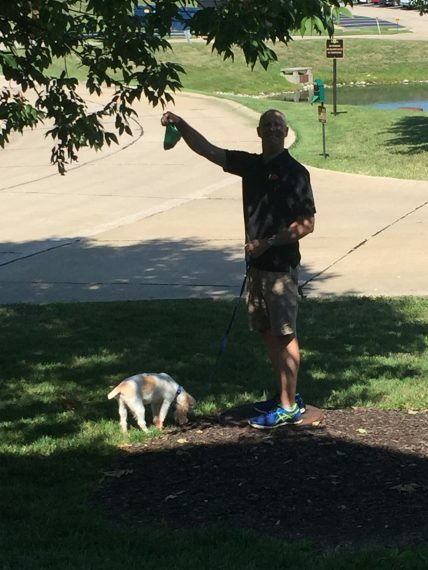 We made it about a mile down the turnpike and visited KK’s great friend, Jack. Jack has been laid up for a while due to a broken leg, and it was nice to visit with him, and hopefully brighten up his day for an hour or so. 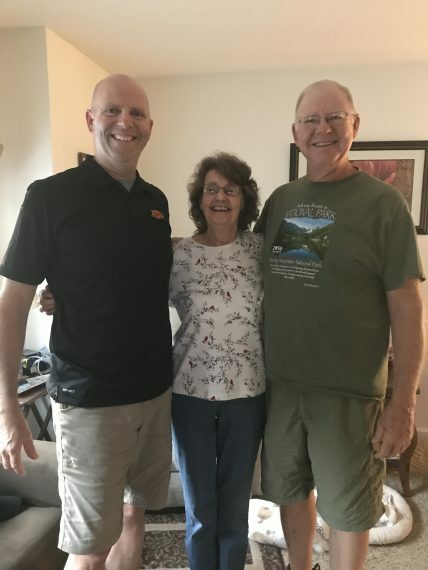 Jack’s wife, Jan, got home about halfway through our visit and brought us up to speed on the hallucinations caused by Jack’s medication. That would surely rival any video of a teenager after getting their wisdom teeth removed. We got back on the road about 9pm with a long drive ahead of us to get to Fenton, a suburb of St. Louis. I remarked to KK that we might not find a Dairy Queen open at this time of evening, and he told me that this kind of talk was not appropriate. The best we can do in place of a DQ was a truck stop around midnight that had an ice cream case. I walked down an aisle to find KK and PK leaned over the case studying their options. One thing I learned on tonight’s drive is that KK likes to reply to the Nigerian prince emails. Of course, these emails are obvious scams and attempt to create elaborate ways to separate a person and their money. KK replies simply with “Bring cash.” He has even had a back-and-forth exchange with the prince one time, but so far nobody has brought the cash. As we passed through Lebanon Missouri, KK talked about a fellow Marine he was in boot camp who was from this town. He couldn’t recall the man’s name, but his hometown of Lebanon remained a memory. KK and his friend were at times assigned to work in the freezer area, and it just so happened the ice cream cups were stored in there. They treated it like an all-you-can-eat ice cream buffet. The only consideration was disposing of the empty cups so nobody got suspicious. We pulled into Fenton at 2am, and were quickly checked into our room. Day 1 is in the books. Our only deadline on Saturday morning was getting downstairs for breakfast before they shut down at 10am. We were eating by 9:30. Our entire day today is devoted to seeing our cousin Earlene, who recently turned 85. We don’t get to see her as often as we used to, so this seemed like a great opportunity to fix that. We probably spent about 6 hours at Earlene’s place split between two visits. 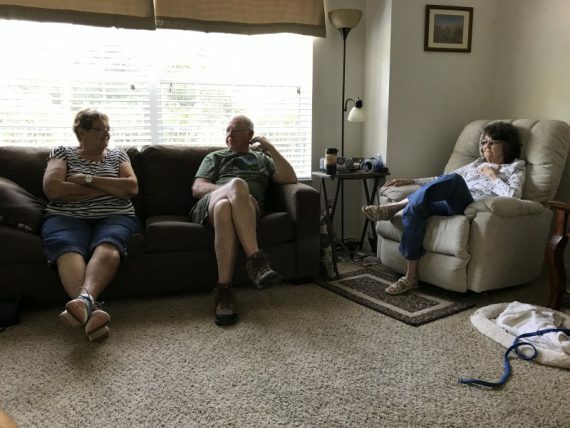 I find it fascinating just to sit back and listen to KK and Earlene tell stories about the family back in the day. One thing I learned was that both my parent’s families had freezer lockers in Stillwater when they were kids. Since freezers in the home were extremely small, it was customary to rent a freezer locker where you would keep your side of beef, or other meats. When you needed some, you just visited the locker and removed it, much like a bank safety deposit box. Earlene recalled to us how she was taught to learn how to spell the word “geography” when she was going to grade school at Sumner. It was the spelling mnemonic of “George Edwards Old Grandma Rode A Pig Home Yesterday”. Must be effective to remember it 75 years later! Earlene has a small dog named Bentley who is 16 years old. The poor guy could not see very well, but he did enjoy being petted. In the evening, we were joined by our cousins Lynda and Neal. It has been way too long since I have seen them also. It’s always good to catch up with family. 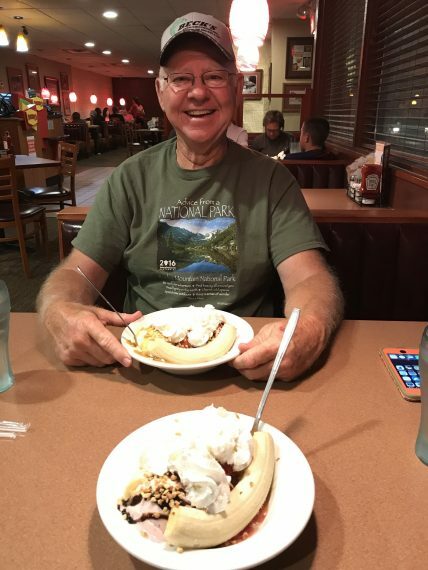 PK and turned in early so KK and I ended the day with a visit to Denny’s for their world famous banana split. I will admit it was large and tasty. The only negative was that the dessert was at Denny’s. This particular restaurant was such a sad place. We were in a part of the dining room where it was us and 20 other empty tables. Once we returned to the hotel, we confirmed that breakfast starts at 6am tomorrow. Our plan is to be first in line. Lights out!